Forum Index > Off-topic Talk > Stolen sword: VE cutlass - please help! Posted: Mon 21 Mar, 2005 1:54 pm Post subject: Stolen sword: VE cutlass - please help! I've just had my Vincent Evans clamshell cutlass that I bought through the classifieds stolen in transit with Fedex. When the package arrived the tape had been cut and resealed and the cutlass was gone. Please keep you eyes open if this sword shows up anywhere. The sword was sent from the US to Denmark and passed through Paris on its way to Copenhagen, Denmark. Oh my God! I'm so sorry to hear this! Did you have it insured? I know that doesn't replace the sword, but I hope you can at least recover that. Oh, my! This is not the same sort of tragedy as having a child kidnapped, or anything like that, but I'll bet that it must feel similar! My sympathies go out to you, Søren. I'm very sorry this has happened. Who was the previous owner on that one? Was that Steve Han's? Ron Luciano's? My sincerest condolences for whatever that's worth! My heart goes out to you. Try not to look directly at the pictures for awhile. I, too, am sorry this happened. It's a buyer's nightmare. I had a Hell's Belle Bowie stolen from my doorstep. Unfortunately, that package was not insured. BTW, it's not mine. Must be Ron's. Looking at the picture, the guard is in shape of a sea serpent, which is what I remember from Ron's cutlass. But I seem to also remember that it was part of a set, cutlass and dagger. Get incontact with FedEx cause this looks like a insider job to me as it would never leave a fedex facility till it was going out for delivery. I feel horrible for you, Ron, and all of us in the community who can feel your pain ! I think nightmares like this enter all our minds, when shipping valuable pieces, but having one become a reality is just terrible ! Money lost may be the bottomline here, but losing a great piece like this to some unknown scumbag is the kind of thing that would keep me up at night ! As was said ..... this is certainly not a life threatening event, or comparable to so many other bad things that can happen in life, but still .... it STINKS ! I wish you the best of luck in recovering it .... keep us posted ! 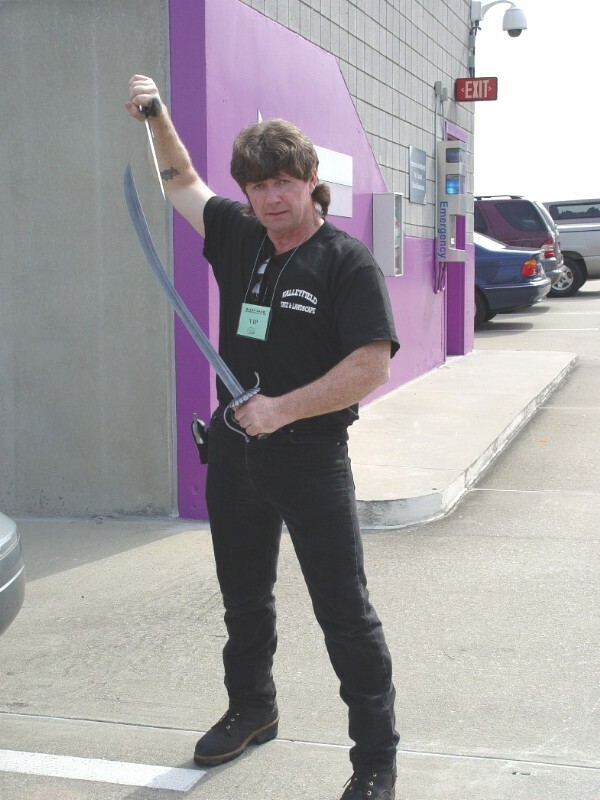 Maker Vince Evans at the 2004 Atlanta Blade Show ! The entire cutlass and dagger are damascus, made from a combination of 5160 and L6 steel. The only parts not damascus are the grip ( which is made of horn), the wire wrap made of silver , and the ferrules made of silver. * This set is based on a set pictured in Boarders Away with Steel by William Gilkerson. This type of cutlass and dagger combination would have seen it's heyday circa 1680-1720, the height of the Golden Age of Piracy. My I too extend condolences out to you Soren. I also had the good fortune of see this sword at Atlanta last year and can agree to what a grand piece it is. Keep on top of FED-EX and do let everyone know of your findings. Mac in Atlanta with that awesome VE cutlass set ! Many thanks for your kind words! The sword was indeed Ron's. Fedex and the danish police are now working on the care and I still hope the sword might be recovered. I'll keep you informed of any progress. Søren, Here's hoping that they can find your sword. I'm sorry for your loss. Søren - your post on your new JT Palikko Swiss Sabre reminded me of your lost/stolen VE. Any update on status of the VE piece? I hope that you were able to retrieve it!! I just so sad I never got to hold it. This whole ordeal really makes me feel sick. As if this wasn't bad enough, whoever has it probably doesn't have a clue what a special piece it is. I'm still holding out hope for you, though, Søren.